Transfer factors are molecules that communicate antigenic immunological information intercellularly and from a donor to a recipient. They support immune function through cell mediated immunity. Transfers factors, which carry antigen specific information to which all tested immune cells respond, are produced by mononuclear cells and serve to support and improve immune function through cell mediated pathways. Mammalian transfer factors, including those of humans are small molecules between 3,500 and 10,000 daltons. [1, 2] Transfer factors are polypeptides that consist of 40 to 44 amino acids  and have a conserved region and a variable region. From a molecular biological standpoint, these two properties are analogous to antibodies, however transfer factors’ functions of cell mediated immunity (CMI) and non-specific immunological activity differ almost completely from the functions of antibodies. 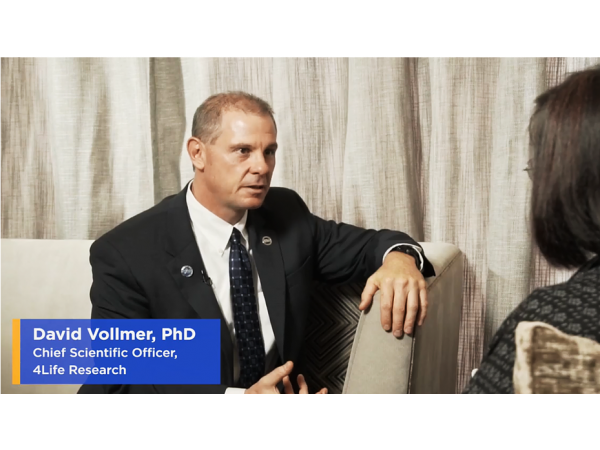 The molecules that have a molecular weight of less than 3,500 daltons modulate immune response but they do not transfer delayed-type hypersensitivity (DTH). 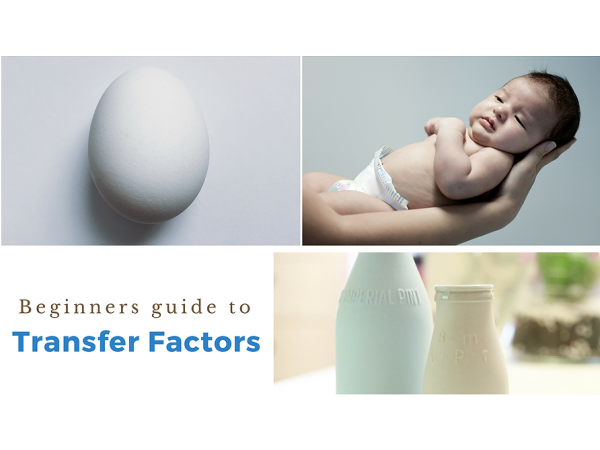 4Life’s transfer factors are sourced from the ultra-filtration of colostrum and from egg yolks. [4, 5] The molecules obtained from the spray dried ultra-filtrate of bovine colostrum are of two classes; the transfer factors present in the ultra-filtrate of ≤10,000 daltons and the nanofraction molecules that are present in the nano-filtrate of ≤ 3,500 daltons. Transfer factors were first discovered in 1949 by H. Sherwood Lawrence when he demonstrated that CMI could be transferred from one individual to another by way of low molecular weight extracts of white blood cells. Transfer factors could transfer DTH of a specific form from a skin test positive individual to a skin test negative individual who subsequent to the transfer would skin test positive for that antigen. In a subsequent study in 1955 he demonstrated that DTH could be passed serially, first from a skin test positive individual to a test negative individual, who became test positive, then 6 months later from the second individual to another test negative individual who became test positive. At the time antibodies were the focus of immune research and little was known of the importance of DTH and of the involvement of T-cells in immune response. Transfer factors promote wellness via cell mediated immunity. These compounds are components of colostrum, an infant’s first meal. They bridge the generational gap by passing cell mediated immunity from mother to infant. Transfer factors' preparations contain more than 200 different moieties of polypeptide molecules with a molecular weight of <10,000 daltons; each moiety potentially having a great number of epitotic variations. These antigen specific factors are synthesized in monocytes and stored in the cytoplasm or on the cell membrane. A significant body of evidence indicates that the primary biological function of transfer factors is to recruit and specifically sensitize previously uncommitted lymphocytes. These sensitized T-lymphocytes initiate the events of cell-mediated immunity, thereby, promoting immunity not only at the site of antigen challenge but also throughout the body. The effect of transfer factors on antigen mediated immunity, via B-cells, is not completely understood; however, clinical studies have reported an increase in particular antibodies, such as IgA and IgG, during transfer factor administration. Although most clinical trials with transfer factors have used parental administration; oral administration has also demonstrated successful transfer of DTH and cell mediated immunity in recipients. Dose response studies, which compare various routes of administration, have been performed in both human and animals. Results of these experiments refute any arguments that the acidic or enzymatic environment of the gastrointestinal tract effects oral administration of transfer factors. Peripheral blood mononuclear cells were isolated and pooled from several healthy donors. Sixty thousand cells were added to each well of a 96-well microtiter plate. Various immune modulating ingredients, including 4Life Transfer Factor® Tri-Factor® Formula, were added to select wells on the plate and a 48 hour incubation started. At the end of the incubation period 30 thousand K562 cells were added to each well. MTT assay techniques were used to determine the cytotoxic index. 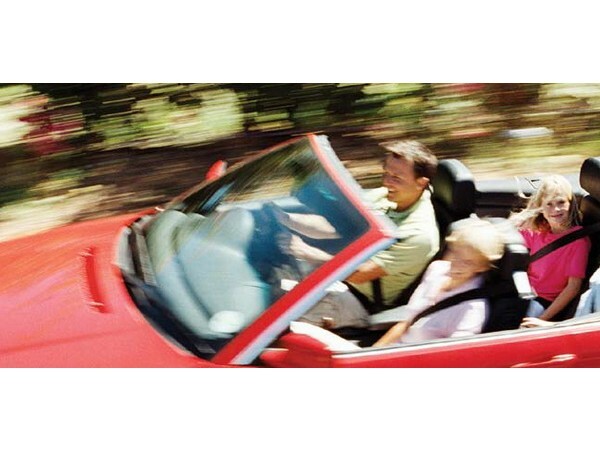 The various 4Life Transfer Factor products resulted in cytotoxic indices of 80-98%. By comparison, mononuclear cells incubated with IL-2 for the same 48 hour period produced a cytotoxic index of 88%. Multiple studies were performed using the FDA-approved diagnostic CD4 T Helper cell assay kit and/or a T Cell Memory (CD8) assay kit under development by the same company. Similar to the NK cell research described above these in vitro studies were performed on 96-well microtiter plates measuring ATP production via a luciferase-based luminescence reaction. The CD4 assay utilizes PHA-stimulated cells isolated from whole blood via the use of Dynabeads™. An 18 hour incubation of these isolated, stimulated CD4 cells with the 4Life Transfer Factor products has resulted in a modulation of immune cell activity as exhibited by a decrease in ATP production without a negative impact on cell viability. It is hypothesized that this reduction in ATP production is a result of a redirection in immune cell focus, essentially diminishing the distraction induced by the addition of PHA to the microtiter wells. 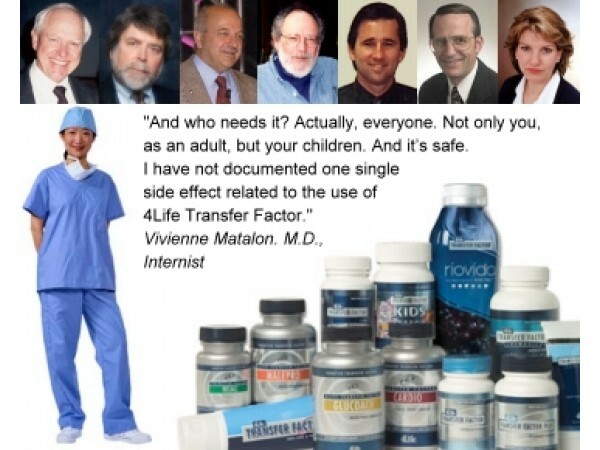 Twenty-four subjects naive to transfer factor supplementation were enrolled in a small-scale, preliminary study. Twenty-one were included in the final analysis. Salivary samples were collected from each subject weekly at roughly the same time of day and day of the week. Saliva was collected over a 5 minute period via passive drool while subjects chewed on a piece of Parafilm™. The samples were put on ice and then frozen at -70°C until assay. The commercial Salimetrics™ salivary IgA assay kit was used for analysis. 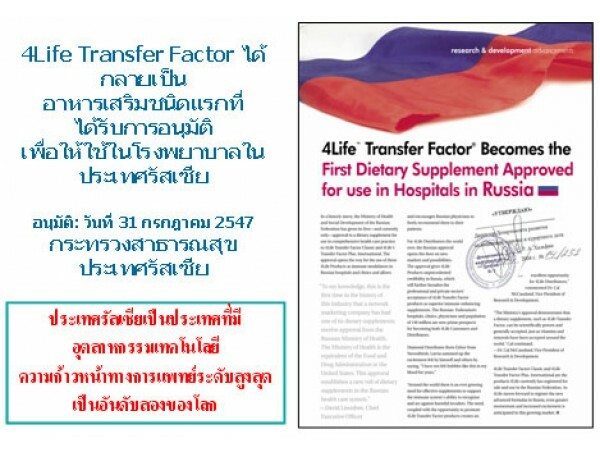 Subjects were given 4Life Transfer Factor Tri-Factor formula at 2 capsules per day for two weeks and then transitioned to 4Life Transfer Factor® RioVida® Tri-Factor® formula at 60ml per day for an additional 2 weeks. At the end of the 4 week supplementation period the group showed an average 73% increase in salivary secretory IgA (SIgA) production over their baseline value. Furthermore, none of the 21 subjects showed a SIgA production rate less than their baseline value at the end of the study. A study conducted with 30 college students found that either 15 or 30 days of transfer factor administered according to label dose helped them maintain their health. Those that took the product for 30 days showed a prolonged health maintenance than those who took it for only 15 days. Groups of 20 mice each were compared in terms of organ weights, serum immune parameters, strength (dynamometer and hanging time), and isoproterenol-induced salivary hyperplasia. One group was injected with 4mg/kg of a product containing transfer factors. The treatment group showed improvements in all the aforementioned parameters. Isoproterenol-induced salivary gland hyperplasia declines with age. This diminished response is thought to be a consequence of decreased lymphoid cellular regulation of somatic tissue growth. The increased hyperplasia seen in the treatment animals approximated that seen in younger, untreated mice. 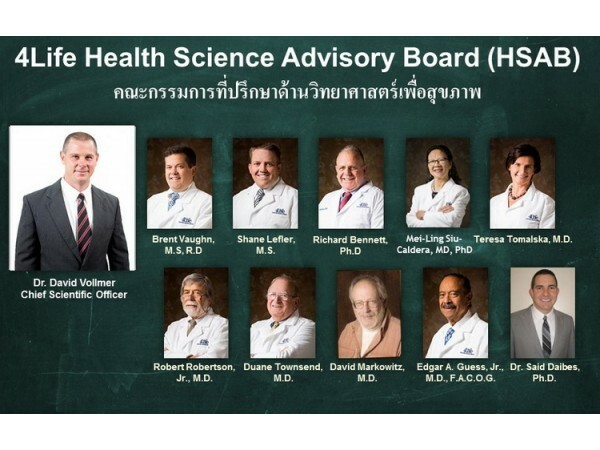 There were no significant changes noted in height, weight, or rectal temperature between the two groups. Based on the results of this study an additional study was undertaken in 11 older men aged 55-73. 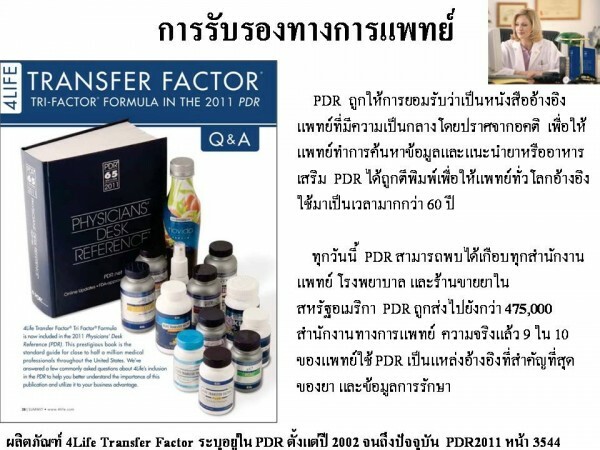 Subjects were given 3 capsules per day of a product containing transfer factors 5 days a week for 6 weeks. At the end of the six week study period a determination of biological age using the Kiev method [17, 18] showed a reduction of approximately four years. There were significant improvements in several parameters of cardiovascular function, hearing, balance, vital lung capacity, ability to hold their breath, and some subjective measures. In a study of acute toxicity rats were assessed for fourteen days following a single gavage of 4Life Transfer Factor. Five female SD rats were each gavaged with a dose of 2,000mg/kg. No treatment-related mortalities occurred and there were no clinical signs of toxicity. No significant difference in body weights occurred. No gross lesions were found at necropsy in any of the animals. Thus, acute toxicity is considered to be greater than 2,000mg/kg. Since the discovery of transfer factors in 1949 there have been no reports of allergic reactions  or of any side effects resulting from long-term use of 10 years or more. The use of transfer factors is contraindicated in persons receiving immunosuppressive therapy, though actual interactions have not been documented. Fudenberg, H. and G. Pizza, Progress in Drug Research, 1994. 42: p. 309-400. Lawrence, H.S. and W. Borkowsky, Biotherapy, 1996. 9(1-3): p. 1-5. Kirkpatrick, C.H., Mol Med, 2000. 6(4): p. 332-41. Hennen, W. and D. Lisonbee, U.P. Office, Editor. 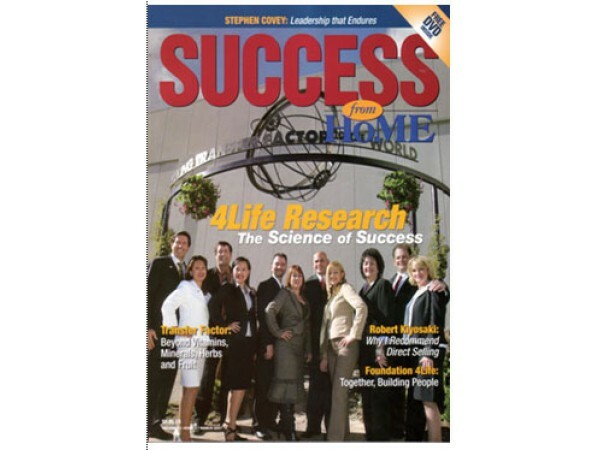 2002, 4Life Research, LC: USA. Wilson, G. and G. Paddock, U.P. Office, Editor. 1989, Amtron, Inc.: USA. Lawrence, H.S., Proc Soc Exp Biol Med, 1949. 71(4): p. 516-22. Lawrence, H.S., J Clin Invest, 1955. 34(2): p. 219-30. Levin, A.S., L.E. Spitler, and H.H. Fudenberg, Annu Rev Med, 1973. 24: p. 175-208. Fudenberg, H. and H. Fudenberg, Ann Rev Pharmacol Toxicol, 1989. 29: p. 475-516. 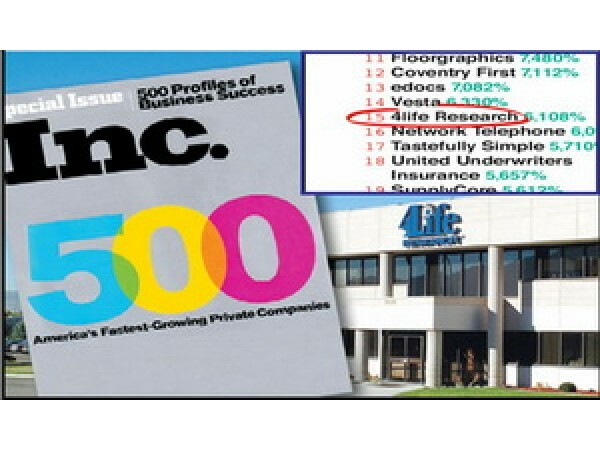 See, D., S. Mason, and R. Roshan, Immunol Invest, 2002. 31(2): p. 137-53. Dwyer, J.M., Biotherapy, 1996. 9(1-3): p. 7-11. Wilson, G.B., R.T. Newell, and N.M. Burdash, Cell Immunol, 1979. 47(1): p. 1-18. Radosevich, J.K., G.H. Scott, and G.B. Olson, Am J Vet Res, 1985. 46(4): p. 875-8. Kirkpatrick, C.H., Biotherapy, 1996. 9(1-3): p. 13-6. Klimov, V. and E. Oganova, in Euromedica-Hannover 2004. 2004: Hannover, Germany. p. 15-16. Chizhov, A., et al., in Euromedica. Hanover. 2007: Hanover, Germany. Agadzhanian, N., et al., ATMA, 1996. Chebotarev, D., Annals of Gerontology and Geriatrics, 1984.